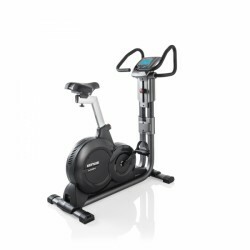 The Kettler exercise bike Axiom is a very stable fitness equipment for regular cardio training. The maintenance-free induction brake produces wattage from 25 to 600 Watt and works very silent. The Kettler exercise bike Axiom: Top quality "Made in Germany"
The Kettler exercise bike Axiom offers beginners and ambitious sportsmen a complete equipment and approved Kettler quality. The construction of the double tube frame can be loaded up to 180 kg and is ideal for challenging workout sessions. The Kettler exercise bike Axiom has a balance mass of 10 kg for a comfortably smooth course of motion. The induction brake is silent and wear-free. Resistance can be varied from 25 to 600 Watt. 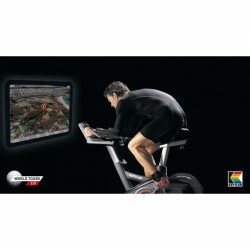 The Kettler exercise bike Axiom has an easy-to-use training computer informing clearly about workout data like distance, pace, cadence, etc.. Eight programmes of the Kettler exercise bike Axiom offer a motivating training variety - Two of it are pulse controlled. 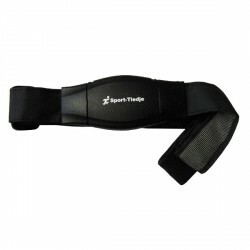 The pulse is measured by a provided earclip or a chest strap, which is available as accessory. Connect the Kettler exercise bike Axiom with your computer and the separately available Kettler World Tours software via a USB interface. Simulate exercise tours all over the world and analyse in detail your workouts with the Kettler exercise bike Axiom. Participate in online races against friends. The Kettler exercise bike Axiom has a deep step-through and a padded saddle for comfort while execising. The multi-position handlebar and saddle are adjustable in height, the seat is horizontally adjustable. The Kettler exercise bike Axiom has an integrated height levelling for safe stability on uneven floors as well. The exercise bike can be easily moved by transport wheels. het is een goede homestrainer en goed verstelbaar zadel en stuur. geen nadelen. Vrij prijzig maar het is de prijs dubbel en dwars waard! De fiets staat als een huis en fietst zeer soepel. Kettler Software World Tours 2.0 Toimitettavissa heti varastosta! Sport-Tiedje Komfort Premium lähetinvyö Toimitettavissa heti varastosta! Polar lähetinvyö T31, koodaamaton Toimitettavissa heti varastosta! 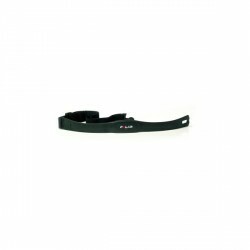 Kettler exercise bike Axiom lisätään vertailulistaan.